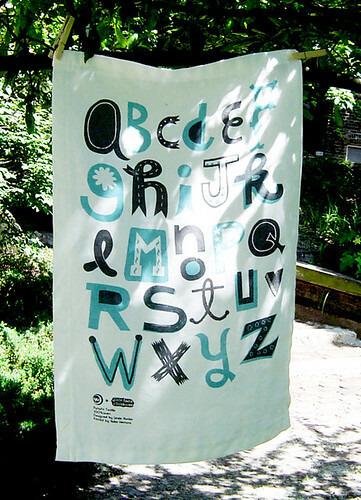 Alphabet Tea Towels, originally uploaded by Linzie Hunter. i missed them AGAIN. i can't believe it. UPDATE: as sam just very kindly pointed out, i haven't missed them, they just haven't been listed yet! yay! i may just be able to snag one this time, if only i'm awake when they go into the shop in north american hours... fingers crossed, people. UPDATE 2: i got one! i got one! not the exact colours i wanted, i had to settle for the green and blue combo but i got one. sometimes being up at 5am really pays off. I don't think you have missed them again. I don't think they have been put in the shop yet. I looked at the sold items and there haven't been any sold recently...... you may still be in luck! At leas i hope that is the case, i am keen for one too! sweet! i think you are right, i forgot that i'm a day ahead in australia... i wonder what time they'll be available? thanks for the tip!